Juliana Spahr is professor of English at Mills College and contributing editor for Commune. She is the author, most recently, of DuBois’s Telegram (Harvard, 2018). 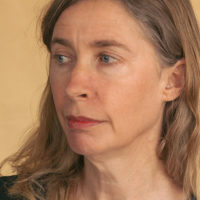 She has written eight volumes of poetry, including The Winter the Wolf Came, Well Then There Now, and Response, winner of the National Poetry Series Award. She is also the editor, with Claudia Rankine, of American Women Poets in the 21st Century and received the O. B. Hardison Jr. Poetry Prize from the Folger Shakespeare Library.